In his Author's Acknowledgments at the end of Dodger, Terry Pratchett calls the book historical fantasy, not historical fiction, because he's tweaked some historical material. He moved some people who actually existed in the nineteenth century to a different point in the nineteenth century, for instance, and put the offices of a real newspaper on Fleet Street because he couldn't determine where it actually was located. I suspect there are many historical novelists who've done far worse without flinching and got nowhere near as good a result as Pratchett gets here. Dodger is an amazing combination of character and setting. The plot, maybe, is a little simple. To me, the most fantastical element in the book is the way the wonderful Dodger makes his way up the ladder in life. However, that may be a play on the work of Charles Dickens, whose books I have very little knowledge of. Dickens appears as a character in Dodger, and I'm making an assumption that Dodger was inspired by Dickens' own Artful Dodger. Though that's a stretch for me because I haven't read the book in which he appears. Dodger's success in life, as a result of his own resourcefulness, innate talent, and goodness, may also be something that occurs in nineteenth century English fiction. Just guessing. You often read about world building in science fiction and fantasy. But every book has an imaginary world, even if it's set in 2013 America. Historical novels, in particular, have worlds that require intense work. Dodger's is incredible. You have place, you have sociology, you have language, you have clothing, you have attitude. You have everything you require for a world. I rarely think to comment on covers. 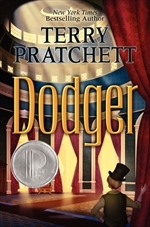 But I've noticed that Tanita Davis and Sarah Stevenson do at Finding Wonderland, and I do have some thoughts about Dodger's. While the American cover (see above) makes for a beautiful book object, I think it's misleading. The character looks very young. He's around seventeen in the book, and while he seems inexperienced in terms of not knowing the ways of the moneyed classes, he is, in his own way, a man of the world. That's why he's able to do the things he does. The British cover may be less attractive, but I think it gives a better feeling of the character.